*Follow us on Pinterest right here! *Be sure to also check out our '10 Essential Newborn Products' list right here! *For more pregnancy and baby goodness, subscribe to Bubby and Bean right here! *Follow along with our baby adventures on Instagram right here! Hello friends! Savannah here from Maiedae. I'm SO excited for sweet Melissa and this special time she is having with her beautiful newborn. My husband and I are expecting our first little one on February 3rd and we can hardly wait to meet him! 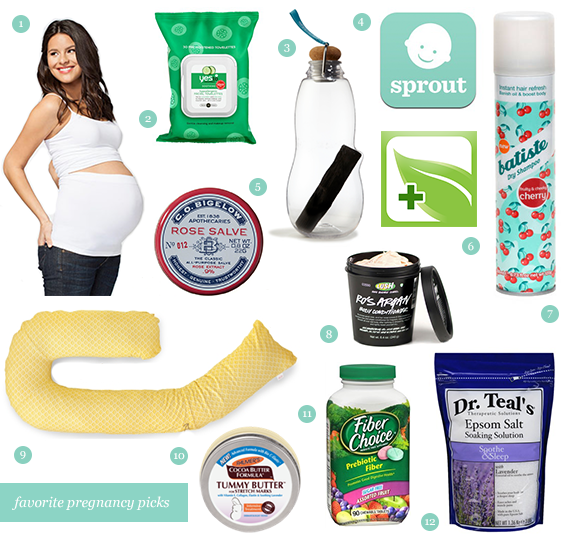 Today I wanted to share with you some of my favorite "pregnancy help" finds that I continue to use over and over again to help throughout each trimester. 1. Belly Band - I have loved using a belly band during pregnancy. During the first 25-30 weeks of pregnancy it was a great way to continue wearing my old jeans and feel an extra sense of support. It's also great to use under tops that aren't quite long enough. I've worn a lot of black during this pregnancy and own a black belly band. I love wearing it under my tanks tops as extra support and a seamless look. Also, its a great extra layer to keep yourself warm during the cold months! 2. Facial Wipes - There are many days when exhaustion gets the best of you and you just don't have the energy to complete your nighttime face cleaning routine. I have found myself using these facial wipes over and over again to get all of my make-up off from the day and do a quick cleanse. I LOVE them. Total time savers. 3. Self-Filtering Water Bottle - Drinking lots of water during pregnancy is super important. If you prefer filtered water, I highly recommend this amazing carbon self-filtering water bottle by Black + Blume. My husband got this for me recently and I love it. The carbon filter lasts for 6 months at a time and beautifully filters any tap water, it also adds good nutrients back into your water. Yes please! 4. Sprout App - I have been using this app since we found out about the pregnancy in May. This is a beautifully designed app that tracks the development of your little one each week. It also has a great space to record your appointments, doctor questions, weight, fetal kicks and contractions. I especially love how beautiful each week of development looks. No strange fruit comparisons here! 5. Salve & Lip Balm - Not only do I love the smell of this balm but I love how moisturizing it feels. My lips are constantly feeling chapped and this has been a great way to keep them feeling nice. This product can also be used on dry patches. Multi-use products are my favorite. 6. Paperless App - Minds can get mushy during pregnancy. I've often found myself forgetting things, especially if I don't record them. I LOVE this app. It's a great way to keep track of all your to-do's and lists in an easy, attractive way. 8. Body Conditioner - I love using Lush's body conditioners/shower smoothies. This product is meant to be used after body wash. I love putting this stuff all over my tummy, letting it soaks for a minute or two and then rinsing it off. It makes my skin feel so soft and smell so good. 9. Pregnancy Pillow - I have found myself using this on and off throughout my entire pregnancy. Sometimes you need the extra comfort and support during pregnancy while you sleep and this is the perfect way to give you the extra comfort you need. It's especially helpful if you're not a natural side sleeper. 10. Tummy Butter - This stuff is amazing and so moisturizing. Every-time I put it on it makes my tummy feel soft and smooth for days. It's a great way to help prevent stretch marks and keep things supple. 12. Epsom Salt - One of the side-effects I've struggled with most during pregnancy is back pain. During the first and second trimester it was mostly in my lower back and during the third trimester it's been mainly in the middle of my back. A nice warm bath with a cup or so of epsom salt is a great way to get some relief. Plus the smell of the lavender is so soothing and helps get you sleepy for bedtime. Savannah and I announced our pregnancies right around the same time, and it's been so much fun comparing stories along the way and counting down the days until our little ones' arrivals (only three more weeks for her!). This list of pregnancy helpers that she compiled is spot on. I'm so grateful that she put it together to share with you guys! Make sure you pay a visit to her blog. It's full of gorgeous pictures and fantastic features about beauty, fashion, home, and baby. Congratulations to you both! We're expecting our 3rd in March. Finally, a boy! Yay! Awesome! Congrats to Savannah and Melissa! This list is great, I agree with all of them (although I never used epsom salt). And I have to admit, I loooove using LUSH's Ro's Argan body conditioner regardless, it is incredibly good! Awesome list of items here. I want to check out that self-filtering water bottle and the Paperless App - good stuff even if you're not preggers! I love that Rose Salve, I use it for everything! Great list, I'd also add a good supply of Luna bars or energy bars for on the go, and also some nice smelling massage oil.